Selling exotic locales on cruise packages happens with beautifully crafted images, but getting guests to come back over and over again, is a result not just of gorgeous places, but also delicious food. Cruise ship chef jobs are meant not only to satisfy appetites, but create interesting gastronomic experiences for foodies. Knowing the variety of exotic ingredients available and how to use them will give you that edge over others, and offer that twist to every day dishes that will leave cruise ship guests mind-blown. One secret ingredient making waves around the world today is black garlic. It’s a type of caramelised garlic used in Asian cuisine, but its sweetish, almost-charred and complex flavour has allowed it to work with everything from ranch-style dressing to confits and even sandwich spreads, steak rubs, pâtés and even savoury ice cream. In lieu of Tabasco, chefs are now moving to gochujang, that piquant Korean addition that has been discovered to go so well with spaghetti Bolognese, curries and fajitas. Cruise ship kitchens could be smart to stock this versatile ingredient that holds its own in popular Korean food but can slide over to the fusion section as required – used with corn on the cob, burgers, pulled pork or even a bloody Mary. Based on which part of the world the cruise liner is in, adding locally sourced exotic meats to the shopping list can help raise the bar of the cruise ship kitchen. Kangaroo meat – relatively inexpensive in Australia – offers a delicious gamey flavour in comparison to regular steaks, and can be used in burgers, sausages and even pizza. Like kangaroo, another Aussie meat – emu – is also nutritionally valued being low in fat and can serve as a delicious option to health conscious travellers. Stocking up on achiote in the Caribbean, grains of paradise in Africa, amchur powder in India, machalepi in Greece, fennel pollen in Italy or dried kaffir lime leaves in Thailand means you’ll get the real deal when you source it locally and also add authentic flavour to your dishes. It’s important to read about various ingredients and have a taste when you get the chance – such as visiting a local market or food street when in port. Locals will only ever use good quality ingredients and checking out how these are used in cooking will help you develop a vision of incorporating them on board. By tasting local ingredients on their own and also in various dishes, you will get an idea of the quantity to be used as well, since over use is an easy way to turn what could have been an amazing, exotic dish into something quite unappetising. The key to doing well in any industry, including hospitality, is to keep upgrading your skills and innovating. Even small things like substituting an exotic spice for a regularly used one can subtly change the nature of the dish, something that will find favour with well-travelled food lovers. This entry was posted in Cruise Life on August 29, 2016 by admin. Cruise ship jobs, particularly in the galley, offer a great experience, not just in terms of work but also in terms of life learning. Cruise lines often have at least one multi-cuisine restaurant, no matter how big or small the vessel is. Guests come with different preferences, and this style of menu allows them a variety of choices. Taking on a job as a cruise ship chef will be easier if you have experience with different styles of cuisine. Getting trained in a reputed culinary institute will also get you up to speed on the latest trends in various culinary cultures. But it isn’t just the dishes that are multi-national. The chefs on board come from a number of different places around the world too. As a cruise ship chef, your colleagues and work mates could be from your home town, speaking your own language, or from anywhere around the world. It’s possible to have 20 or more nationalities working in the same kitchen every day. Working with people from your own community builds familiarity and comfort, but being with people from different places offers its own share of learning. 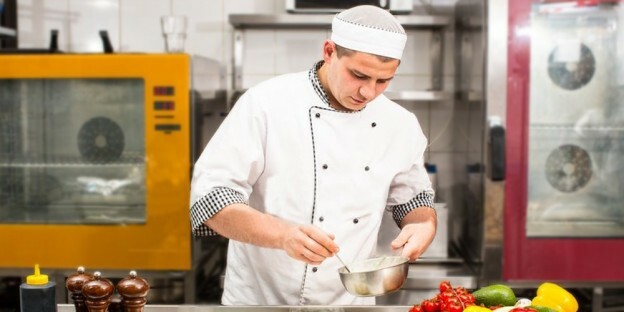 Most cruise companies require the chefs they take on to have a minimum level of understanding English, as this is a universal language learnt in most countries around the world. Being fluent in English is an added perk as it ensures you are able to follow instructions with ease and also communicate difficulties and issues without trouble. Being in close quarters with so many nationalities also allows you to learn about cultures from various places. Often, throughout life, people are restricted to culture from their own communities, barely exposed to cultures even from other states in their own country. Religious norms, social life, and even hygiene practices can differ. Working with people from cultures different from your own will open your eyes to a global culture, an understanding and respect of other people’s beliefs, as well as tolerance. It’s also a great place to learn a new language – or several if you wish! Hanging out with your chef mates from different places lets you swap treasured recipes you would never have come across even in a restaurant serving that particular style of food. Influential American photographer Harvey Lloyd once said that “travel is like an endless university; you never stop learning”. With cruise chef jobs, this quote holds true all the more. The learning never stops – not with the pots and pans in the kitchen, or with the people you live and work with alongside. This entry was posted in Cruise Life on August 15, 2016 by admin. It’s not just humans who have godparents. Traditionally, godparents take a keen interest in a child’s upbringing, and in many cases in times long gone, played a part in naming the child. The tradition of godparents also exists in the maritime industry, although obviously in not quite the same way. Godparents of cruise ships reveal the name of the vessel. Ship naming goes back into history, with evidence leading even to the third century BC, of Babylon – in modern day Iraq – celebrating the launch of a ship. Many of the main western civilisations, including the Romans, Greeks and Egyptians, had a tradition of calling on their gods for protection of ships before they set sail. But it was the Vikings who had a major role to play in modern-day ship naming by godparents. This ancient Scandinavian civilisation would have a sacrifice and mark the launch of their fearsome ships with blood. Later, the Medieval Ages changed tradition to be a little less gruesome, and offered wine instead. It was believed that the godparents would ensure the safety of the ship and its passengers. Earlier, religious men or officials led the naming ceremony, but now it is mostly women who christen ships. Cruise ships typically have a grand ceremony for the christening with the godmother, godfather – or in some cases, godparents – appointed to officially reveal the name by smashing a glass bottle on the hull of the ship. The ship is decorated with flags and lots of ribbon, and a band strikes up with song as the bottle hits the ship. These days, it’s often a bottle of expensive champagne. It is usually celebrities or famous people who are called on to christen cruises and become their godparents. 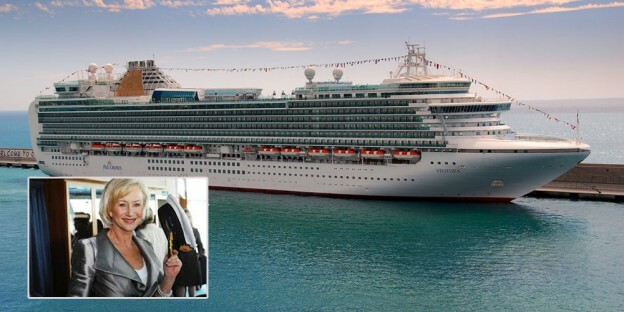 The Queen of England was called to be godmother of P & O Cruises Britannia and her granddaughter-in-law the Duchess of Cambridge christened Princess Cruises’ Royal Princess. In both cases, a Nebuchadnezzar, a 15l bottle of champagne, was broken against the hull in celebration. Actress Dame Helen Mirren is godmother to P & O Cruises’ Ventura cruise line. Sometimes, more than one person is named godparent of the cruise. American dance company The Rockettes christened the Norwegian Breakaway. While most godparents don’t have much to do with the cruise line after the ceremony, The Rockettes featured on a few sailings. Royal Caribbean cruise line Anthem Of The Seas wanted to do things a little differently and had a contest to select the godmother of the ship. Disney and Royal Caribbean took things a bit further and went fairytale, appointing Tinkerbell from Peter Pan and Princess Fiona from the Shrek series to be godmothers to their cruises Disney Wonder and Allure Of The Seas. This entry was posted in Cruise Life on August 1, 2016 by admin.